Prospective trial of outpatient primary care clinics at Veterans Affairs medical centers comparing 3 methods for measuring the quality of care for 4 common outpatient conditions: (1) structured reports by standardized patients, trained actors who presented unannounced to physicians' clinics (the gold standard); (2) abstraction of medical records for those same visits; and (3) physicians' responses to clinical vignettes that exactly corresponded to the SPs' presentations. (CPV®) vignettes are a valid measure and comprehensive method that directly focuses on the process of care provided in actual clinical practice. 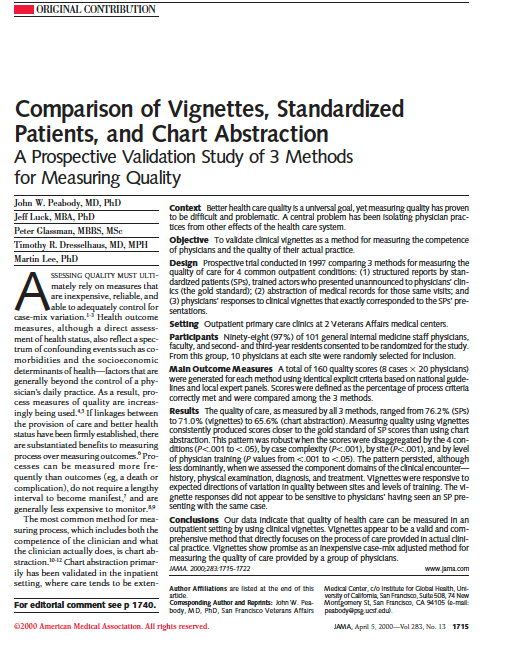 Vignettes are an inexpensive case-mix adjusted method for measuring the quality of care provided by a group of physicians. Prospective, multisite study to examine whether (CPV®) vignettes accurately measure the quality of clinical practice by using a comparison with standardized patients (the gold standard method), and to determine whether vignettes are a more or less accurate method than medical record abstraction. Physicians scored: 68% (CI, 67.9% to 68.9%) when measured by the vignettes but only 63% (CI, 62.7% to 64.0%) when assessed by medical record abstraction. These findings were consistent across all diseases and were independent of case complexity or physician training level. (CPV®) vignettes also accurately measured unnecessary care. Thus, (CPV®) vignettes are a valid tool for measuring the quality of clinical practice. They can be used for diverse clinical settings, diseases, physician types, and situations in which case-mix variation is a concern. We tracked doctors who had previously participated in a randomized policy experiment in the Philippines. The original experiment involved 30 district hospitals divided equally into one control site and two interventions sites that increased insurance payments (full insurance support for children under 5 year old) or made bonus payments to hospital staff. During the three years of the intervention, quality- as measured by clinical performance and value (CPV) vignettes - improved and was sustained in both intervention sites compared to controls. Five years after the interventions were discontinued, we re-measured the quality of care of the doctors. We found that the intervention sites continued to have significantly higher quality compared to the control sites. The previously documented quality improvement in intervention sites appears to be sustained; moreover it was subject to a very low (less than 1 percent per year) rate of decay in quality scores.